The Adventure Villa is family owned and we do understand the importance of every detail that will make your vacation a real success. We make sure our villa is in top shape, well equipped and well supplied; our objective is to provide you with a home away from home. We are using it regularly, we take good care of it, for you and us to really enjoy. We decorated the Adventure around the World Villa to really enhance your vacation and the thematic approach will certainly make your stay a memorable one. Of course, you will find flat screen UHD 4kK and HD TV’s, high speed internet, Wi-Fi access, and free long distance calls to USA and Canada. The villa offers a South facing private pool and has a covered area with colored comfortable patio furniture. If you are looking for an incredible value, a super well equipped villa, fully renovated, in a prime, Disney / Golf / Shopping location that will accommodate, up to 9 guests, stop looking, you just found it !! There are 3 bedrooms; the pirate and princess room will accommodate 3 young adventurers, the Harry Potter room is equipped with a queen size bed and finally the jungle bedroom has a king size bed. There are 2 full bathrooms, with one ensuite to the jungle room. In the living room there is a double size comfortable sofa bed. The villa offer a south facing private pool, to maximize the sun exposure, after all Florida is the sunshine state. As well there is a covered area with patio furniture, so you can take a break from the sun, organize a meal outside or still enjoy the warm weather on the occasional rainy days. Our garage has been converted to a game room with a 7 foot pool table, air hockey and foostable in a nice Cars theme decor! You will enjoy!!! Villa location and surroundings: Our Adventure Vacation Villa is located in the peaceful Indian Ridge Oaks , which has its own children’s playground, community swimming pool and tennis court. We are located close to all Disney attractions and theme parks, only 3.5 miles (5km) from Disney main gate. We are surrounded with beautiful golf courses; in fact we are neighbors to the beautiful Mystic Dunes golf club. Central AC system. Except for the garage (game room). 55 inch 4K UHD flat screen Tv Reading and relaxing area in the living room. BBQ grill is NOT maintained by the cleaning staff. It is the responsability of the guest who use the BBQ to clean the grill after use. We stayed here for our Disney vacation. My kids absolutely loved it; from the themed bedrooms, to the pool, the game room, everything was a hit! I would definitely recommend. We had a wonderful stay! Would rent again. Our family enjoyed our stay at the adventure villa. The villa was close in proximity to stores and attractions and had plenty of space for our family. The kids enjoyed the game tables. Thanks! My 20 year old son felt 12 again with all the Disney memorabilia. It was fun and a home away from home. Would definitely go back. My family (four of us including two girls under 3) couldn’t have enjoyed this place more. 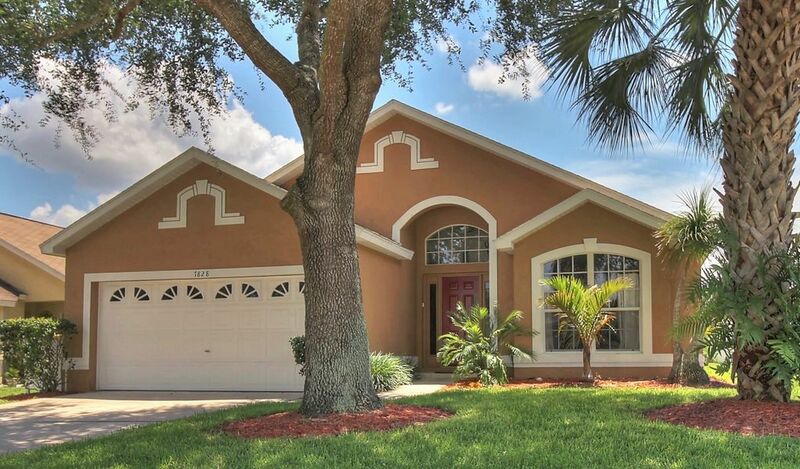 We loved the open layout, warm pool, kid friendly home, close proximity to Disney as well as local shopping areas. It’s the perfect spot for anyone with a family looking to enjoy the local Orlando attractions. * Adventure in Theme parks: Disney's Magic Kingdom - Epcot Center - Animal Kingdom - MGM Studio. Harry Potter and Universal Studio and of course Seaworld.